2010 Vancouver Olympics are going to be Awesome. With the 2010 Vancouver Olympics rapidly approaching, everything is being readied for the events taking place in Whistler. Will you be part of the excitement and history as it’s being acted out in one of the most beautiful settings on earth? The Olympic games have been around for a very long time. The first recorded games were held in 776 BC (no, that is Before Christ not British Columbia) in Greece. The Modern Olympics began in April 1896. The winter and summer games are held every two years on an alternating basis. What you need to know before you arrive in Vancouver. Canada customs, currency, taxes, transportation. Who determines where the games will be held? The IOC (International Olympic Committee) calls for interested cities to bid on hosting the games 10 years in advance of the starting date. The interested citizens form committee’s and begin to plan where they would hold the games, house the athletes, and prepare a presentation for the bid in the hope their city would be selected. Of course, costs to stage the games are very high. Facilities must be built to Olympic standards. Rinks must be built for speed skating, hockey, figure Skating, and curling. Bob-sled tracks and ski jumping ramps must be built on a mountain side. Nordic and alpine ski facilities must be prepared. Update. The Richmond Olympic Oval is now open. Athletes villages must be constructed for the thousands of avid participants who will attend. Facilities must be erected for the thousands of media personnel who will bring the televised and written games to over 3 billion people around the world. The 2010 Vancouver Olympics committee certainly covered all the bases in preparing their bid, and were awarded the games over stiff competition in 2004. As this is written in late 2007 the venues are taking shape. Update April 2009. All of the games venues have been completed and are ready to go. Be sure to check on the Olympics construction here at our updated page. One of the big problems (and highest expense items as well) is transportation. It’s one thing to be part of the normal traffic conveying skiers, snowboarders, campers, and golfers to Whistler from Vancouver (2 hours away). It’s quite another problem to move Olympic sized crowds over narrow roads. The first part of the highway from the ferry terminal past Vancouver up to Squamish produced a real challenge as it is dangerously narrow and twisty. Accidents were many as impatient drivers attempted to pass. The various governments and the committee undertook to rebuild the highway (more than $600,000,000.) The task is well along. The 2010 Vancouver Olympics are marching on. Click here for current road conditions and information on highway improvements. Alpine skiing will take place on the Whistler mountain facilities at the area called Creekside. Click here to view the Creekside Map. Olympic nordic skiing is an exciting event and will take place here just south of Whistler. 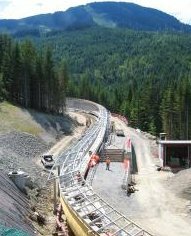 This is a photo of the sliding run under construction. Click here to view how bobsleds are constructed. The Paralympics Games will follow the Olympic Games. Be in the know as to what they are all about. The 2010 Vancouver Olympics will be taking place in Vancouver, Richmond and other venues as well as Whistler. Dusty wants to show you weather conditions as they are now on the mountain. Web Cam, temperatures, ski conditions, avalanche control, weather forecast. Everything you need to know now, as it happens. Just click on her cute little nose and see it all. 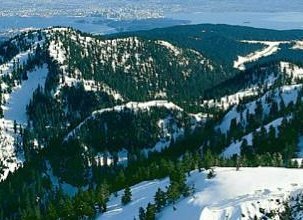 Located in West Vancouver the beautiful Cypress Mountain will be the host site for the snowboard and freestyle competition. What a fantastic view of the city of Vancouver spectators will enjoy. The highway leading up the mountain is where the locals go to take in the spectacular views of Burrard Inlet, Lions gate Bridge, Stanley Park and the cities.